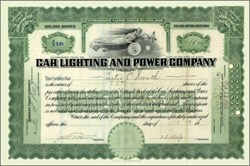 Beautifully engraved certificate from the Car Lighing and Power Company issued in 1915. This historic document was printed by the American Banknote Company and has an ornate border around it with a vignette of an allegorical man and woman flying. This item is hand signed by the Company’s President (Issac Rice, Jr.) and Treasurer and is over 89 years old. Issac Rice, Jr. was the son of the famouse electric vehicle promotor. The company was the sucessor to the Consolidated Railway, Lighting and Refrigerating Company, and they owned the Clothel Refrigerating Company (formally known as the Railway and Stationary Refrigerating Company and the Clothel Company). The Clothel Refrigerating company manufactured ice cream units and mechnical refrigerating devices for cars, ships and yachts.